When Should I Waive My Miranda Rights? Question: When should I waive my Miranda Rights in Tennessee and speak with police about a criminal case? If police want to ask you questions or if you are arrested in Murfreesboro or Rutherford County, tell the police that you want a lawyer with you. Do not speak to law enforcement or answer any questions without your lawyer present. I thought about writing more extensively on this subject, but that just about covers it. Jail Time: Will I Have Time to Turn Myself In? I am often asked “if I am sentenced to jail, will I have time to turn myself in?” The answer, in almost every case, is yes. If you reach a plea agreement in your case, which is where you agree to plead guilty to a certain crime, part of the negotiated agreement will be a certain date upon which to turn yourself in. Plea agreements can be reached in misdemeanor cases, felony cases, and even violations of probation. Typically, you will get thirty days to turn yourself in. However, your attorney may negotiate more time depending on your circumstances. In Rutherford County criminal cases where you are on probation at the time of your court date, the court requires you to take a drug screen on the day you are in court. If you fail the drug screen while on probation, the court will put you in jail immediately and revoke your bond. If a court revokes your bond and sends you to jail, you will not have time to turn yourself in, but be sent to jail immediately. The Rules of Criminal Procedure have certain rules about when someone is turned over to jail. In most cases, if a jury finds you guilty of a crime, the judge will order you to go to jail immediately, pending the sentencing hearing. In some cases, however, you may be allowed to remain outside of jail on bond until the court issues a sentence in the case. In short, whether you will have time to turn yourself in depends on the kind of case you have. In most cases, the parties reach an agreement and are able to negotiate time to turn yourself into jail, which helps people plan ahead, provide for their families, and keep their jobs. What can I do to Avoid Jail Time? I am often asked “what can I do to avoid jail time” in Murfreesboro criminal cases. In short, there is no way to guarantee that you don’t go to jail; however, there are some positive things you can do to increase your chances of avoiding jail. It’s important to note that lawyers can’t guarantee anything. Any lawyer who guarantees you anything is lying to you. In criminal defense, an attorney plays probabilities, and our job is to educate you on likely outcomes and work towards the best resolution possible. Mandatory Jail Time. Jail is required in some cases. For example, if you plead guilty to a DUI offense, there is mandatory jail time: forty-eight hours for a first offense; forty-five days for a second offense; and it moves up from there. Similarly, multiple Domestic Assault convictions require minimum jail time. When Jail Time is not Required. In most cases, there is no minimum jail time, which means that some or all of a sentence could be assigned to probation, not jail. A probation sentence is going to be within the range of punishment for the crime. Consult an attorney to discuss the possible ranges of punishment. Warning: Probation isn’t “Just Probation.” But be careful with probation! Probation is a suspended sentence, which means that you are being sentenced to go to jail and you are being allowed to complete probation instead. If you fail to complete probation, you will be expected to serve every day of that sentence in jail! I often see people take several years of probation to avoid a few days in jail. Later, they violate probation and are on the hook for years of jail time, all because they thought “it’s just probation.” Be careful! What You Can Do. In cases where jail time is not required, there are things you can do to move yourself in the right direction. In short, you want to work on rehabilitating yourself. If you are charged with drug possession, start attending drug classes. If you are charged with domestic assault, complete an anger management class. These are just a few examples, but the summary of how to avoid jail time is to make yourself someone worth helping! Show the District Attorney that you are committed to rehabilitation and they may work out a resolution that will allow you to complete your rehabilitation without required jail time. Of course, this is an over-simplified version of the court process. To know your options, consult with a local defense attorney about your case. How Long Will My Divorce Last? I am often asked “Scott, how long will my divorce take until it is completed?” The answer to that question depends upon how complicated your divorce is, but there are at least some minimum time periods that are easy to understand. In Tennessee divorce, there is a waiting period for every divorce that is filed. In divorces without children, the waiting period is sixty days. In divorces with children, the waiting period is ninety days. The waiting period means that, even if you and your spouse agree on every last detail, you cannot get divorced until at least that much time has passed. One important note is that the waiting period does not start until the Complaint for Divorce is filed, which opens a file with your local court. If you hire a lawyer and it takes three weeks to prepare documents and file, those three weeks, which were used for preparation, will not count toward the waiting period! If your case has been resolved at the time the waiting period expires, then your lawyer will submit the proper paperwork and your divorce will be completed when the judge signs your Final Decree of Divorce. This typically takes between a week to ten days. If your case has not been resolved at the time the waiting period expires, then it is difficult to say how long your divorce will take. It depends on a number of things. If your case goes all the way to trial, your case may take several months, or even over a year. Of course, the easiest way to know how long your case will take is to discuss all of the details of your case with an experienced divorce lawyer. 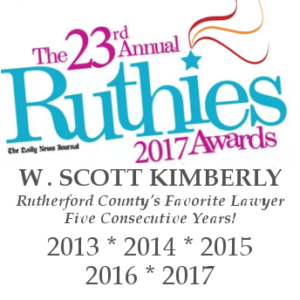 I’m always happy to sit down with folks and share what I know about Rutherford County divorce cases. Do I have to go to Court for an Agreed Divorce? I am often asked “do I have to go to court in an agreed divorce, where we agree on everything?” The answer depends on a number of things, but the answer in Rutherford County divorce cases is often no. In the past, whether or not parties had to go to court in Rutherford County to finish up an agreed divorce depended upon whether or not they had children. In agreed divorces with children, courts typically required at least one party to appear. In courts without children, however, courts would grant a divorce without the parties present, so long as the parties signed certain documents. Rutherford County divorce courts recently announced a change to the longstanding policy regarding court appearances, which now allows all agreed divorces, even divorces where the parties have minor children, to be finalized without an appearance by the parties. This is important because it means that, if you and your spouse agree to the terms of your divorce, you can both file your divorce and be awarded a divorce without either of you going to court. If you and your spouse want to make the process as simple as possible, without either party having to go to court, the first, and most important, step is to consult with an experienced divorce lawyer.